A ban on some foreign tourists has come into force in the cannabis-selling coffee shops of the Dutch border city of Maastricht. City authorities say the influx of tourists buying soft drugs is threatening public order and causing major traffic problems. Coffee shop owners fear banning tourists will hit the local economy. However, the ban does not apply to visitors from Germany and Belgium who are the majority of foreign customers. 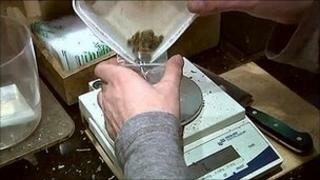 The move comes ahead of a proposed nationwide crackdown being discussed in the Dutch parliament. The BBC's Anna Holligan says the ban is being seen as a test case that could be implemented in other Dutch towns and cities. There are about 700 coffee shops in the Netherlands. The cultivation and sale of soft drugs through them is decriminalised although not legal. An estimated 6,000 people visit Maastricht's coffee shops every day - most making the quick trip across the border from Belgium and Germany. But from Saturday, anyone who is not a Dutch, Belgian or German resident will be told to leave. Hi-tech security scanners have been set up to check passports and ID cards, and police will carry out random checks. City authorities say drug tourists pose a threat to public order. But critics of the policy say the ban contravenes EU policies of equality and the freedom of movement. They include coffee shop owners, who have agreed to co-operate with the ban, though they remain sceptical. Marc Josemans, chairman of the Association of Official Coffee Shops Maastricht (VOCM), said the ban would do more harm than good. "All these clients who are banned from the Dutch coffee shops... have to return to the illegal circuit in their own country, therefore it will become a bigger problem and cause more criminality in those countries," he told Reuters. VOCM says visitors attracted by the coffee shops also spend an estimated 140m euros (£120m) elsewhere in the city every year. Correspondents say the Dutch justice ministry wants coffee shops to operate like members' only clubs, serving only local residents. The European Court of Justice ruled last December that Dutch authorities could bar foreigners from cannabis-selling coffee shops because they were combating drug tourism. Correction 4 October, 2011: We clarified that it is residents, not citizens, of Germany, Belgium and the Netherlands who are exempt from the ban.